It goes without saying that your choice of venue is one of the most important pieces of your wedding puzzle. 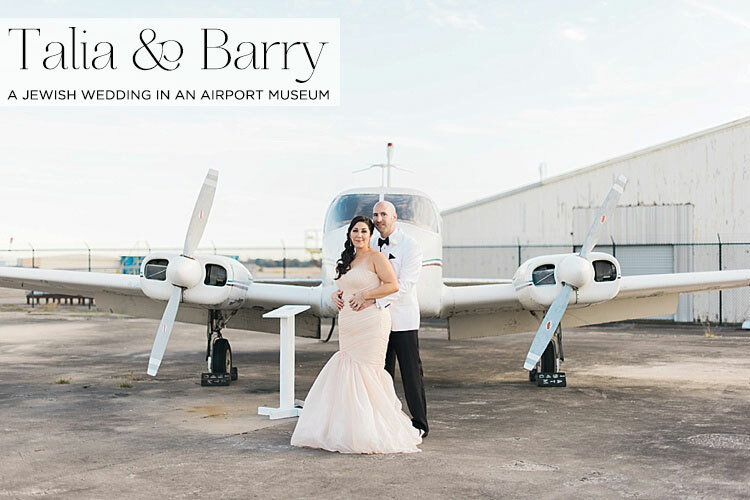 I personally love unusual wedding venues so when Elisheva Golani‘s submission dropped into my inbox, and I saw a wedding that took place in an Airplane Museum and hanger, I literally squealed with joy! 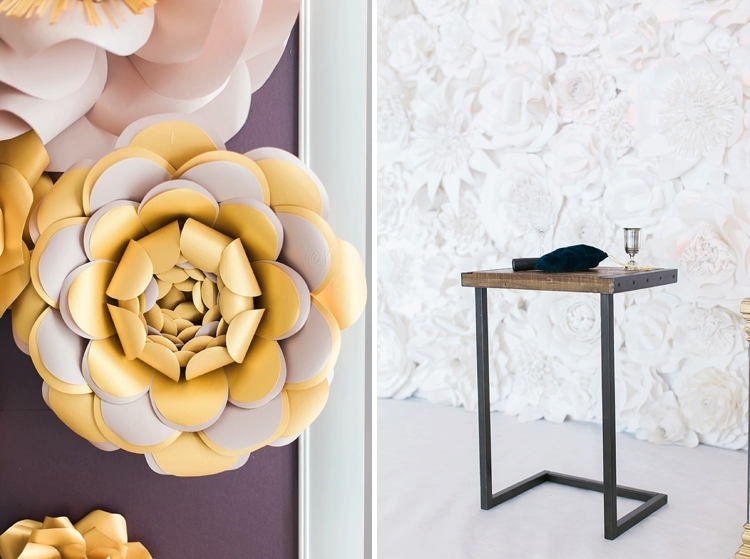 And it gets better — one of Talia’s bridesmaids was Balushka of the incredible Balushka Paper Floral Artistry who created an abundance of paper flowers to adorn the chuppah as well as decor for the entire space. 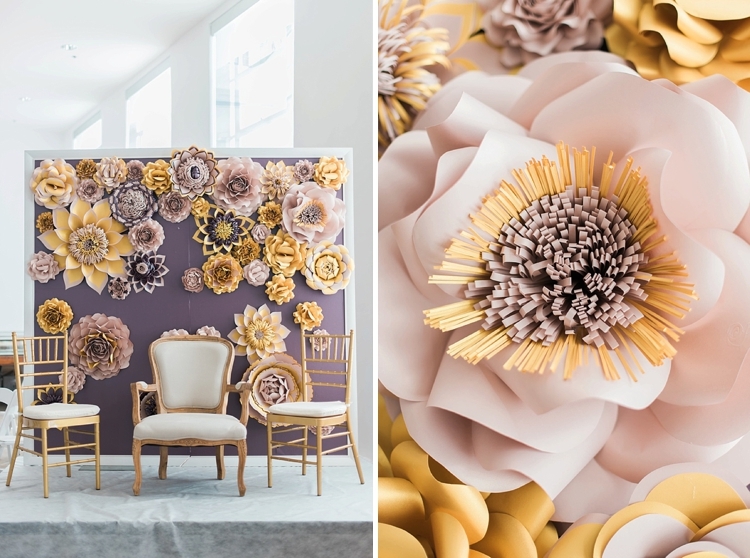 Her work is totally and utterly gorgeous, and the paper floristry fills the space brilliantly. 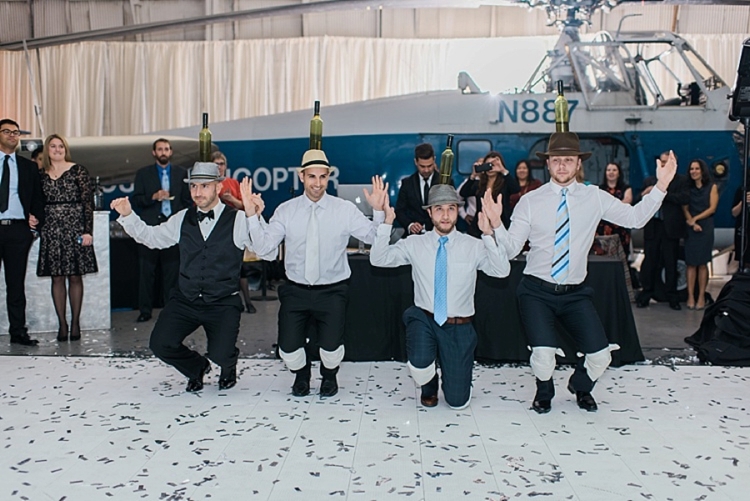 There’s also a blush-coloured wedding gown, a surprise bottle dance choreographed by the groom and his friends, a sparkly confetti canon, and a bride and groom entrance from a vintage airplane to the sound of Rocky’s Theme Tune! Talia and Barry are one super cool, super creative couple and I cannot wait to show your their W Day. Fasten your seat belts folks! Talia, the Bride: Ours is an interesting story – we were first set up 10 years prior to our engagement, by my dad and his tennis partner in 2005. We went on our first date and Barry took me to an Ethiopian restaurant, opened doors, brought me flowers… the whole 9. He was a total gentleman, but alas I was just beginning to explore life as an adult and so was he – needless to say we were both very different people back then. After one date, he called, but I wasn’t interested. Of course, years later, he stuck in my mind as being the kind of guy I needed to date, we reached out to each other on a few occasions- but we were never able to meet up. Finally, we were able to meet for coffee and we were together ever since… He proposed 10 years to the day of our first date- we even went to that same Ethiopian Restaurant! (good thing about engineers is that they keep EVERYTHING). 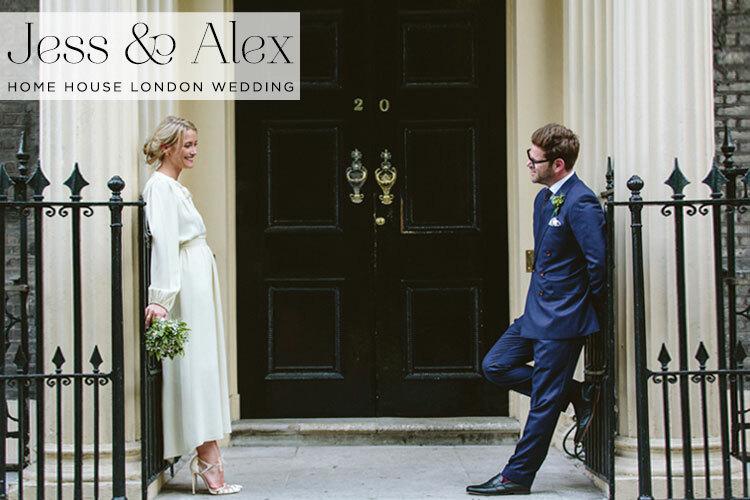 I am whole-heartedly in love with this super sassy, achingly chic wedding set in the magnificent Home House, one of my favourite places in London (and the place I chose to get ready for my wedding and spend the first night of married life!). Think sophisticated fashion and an abundance of green and white blooms mixed in with some brilliant creative details, a vintage Rolls Royce, so much love and warmth, and a wonderfully intimate Jew-ish wedding ceremony, complete with a beautiful chuppah and of course the smashing of the glass! 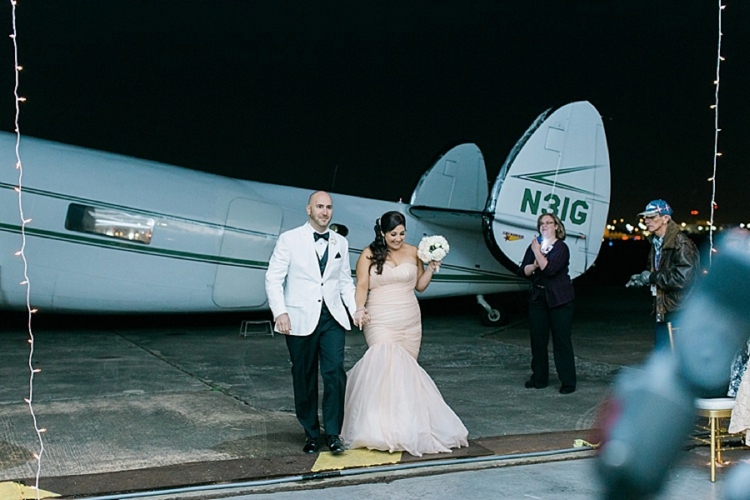 I first heard from the bride two years ago when she emailed me looking for ideas for her interfaith ceremony, and I was so flattered to hear how the blog had helped her in the planning of her Jewish-Catholic wedding. These kind of emails are the sort of thing that I thrive on so thank you so much Jess! And isn’t she just the most stunning Bride? She has that natural, thrown together look we all long for, but somehow never achieve (or maybe that’s just me). She wears the most astonishing vintage Ossie Clark dress paired with Bionda Castana courts. Simply divine. And the groom rocks the fashion stakes too with a very sharp suit, and you won’t want to miss the brilliant message sewn on the inside of his collar which is revealed right at the bottom of the post. It’s a MUST SEE — it will definitely make you chuckle! I want to also single out the couple’s exquisite stationery designed by the super lovely and talented Ruth Kaye Design and calligraphed by the ludicrously talented Paul Antonio Scribe. I know these suppliers very well and it’s so good to see their work at the epicentre of this wedding. 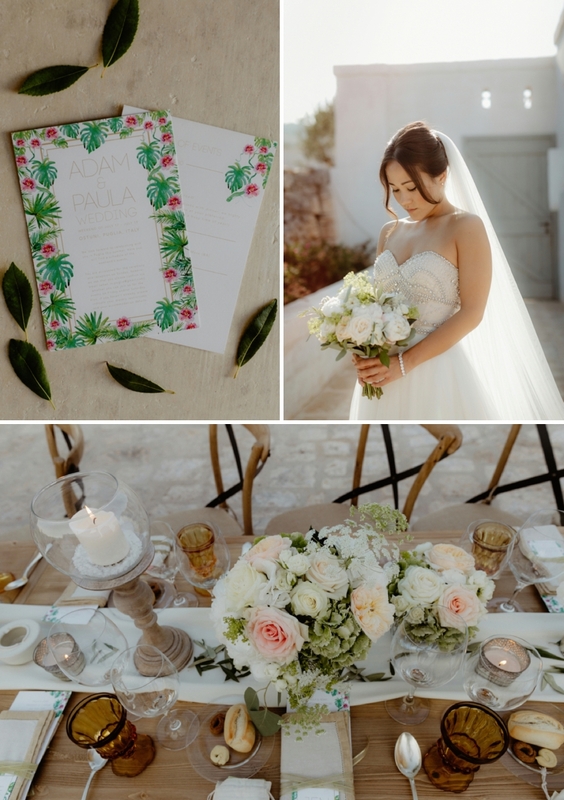 A Watters bride for an ‘all white’ destination interfaith Jewish Wedding at Masseria Le Carrube, Puglia, Italy. Thank goodness we’re having some summery weather in London this week as today’s destination wedding is making me crave eating ‘al fresco’. Those rustic tablescapes are some of the prettiest I’ve ever seen. Don’t they look inviting? And Abigail Warner‘s stationery is so fabulously ‘destination’ too. I’m sure there were no RSVP declines to those! With Adam being British, and Paula being Brazilian, as well as part-Japanese and European, this is another wonderful example of a Jew-ish, mixed faith, mixed culture, mixed nationality wedding and I LOVE it. First of all that styling… Get your pinning finger ready as the girls at Chic Weddings in Italy designed this white-on-white wedding to perfection. Then there’s the fashion.. Paula rocks her two-piece top and skirt by Watters (isn’t it divine?) and just wait until you see her jewelled Givenchy sandals — they’re pure destination luxe! Adam plays his part of the dashing groom in his chic ivory suit too, and the legendary Wedding Smashers DJ’ed until what looks like dawn! 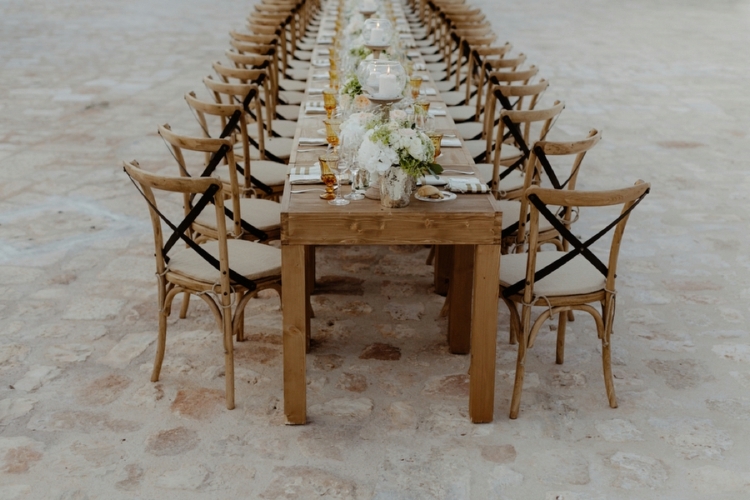 This wedding is filled to the brim with style and grace, and not only do I have the wonderful images for you by Cinzia Bruschini, but also the film by Marco Caputo at the bottom of the post. Come on then, let’s dive in — you’re going to love it. A Carolina Herrera bride for a destination Jewish Wedding in a castle at Castello di Vincigliata, Florence, Italy. 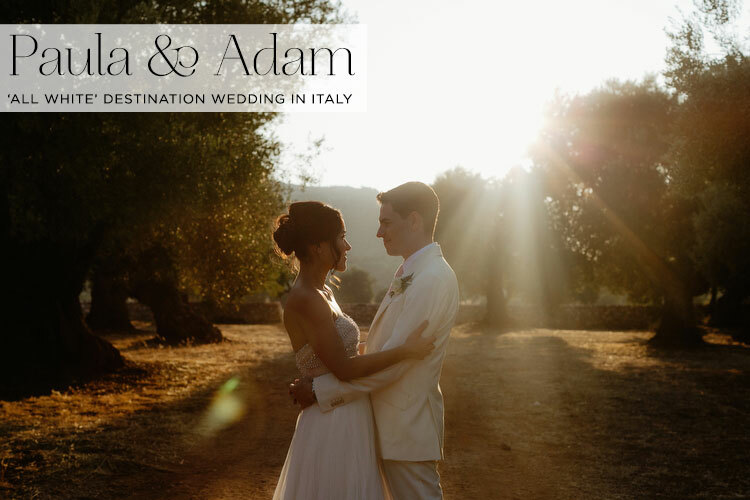 Today’s gorgeous bride first made contact with me back in 2014, when she was looking for supplier recommendations for her destination wedding in Florence. I immediately noticed that her email signature read ‘Head Scientist at playdohlab.tumblr.com‘ and I thought, WOW, I really do have the coolest readers in the universe! And her wedding does not disappoint. Whilst it isn’t play doh-themed (which I was secretly hoping for!) 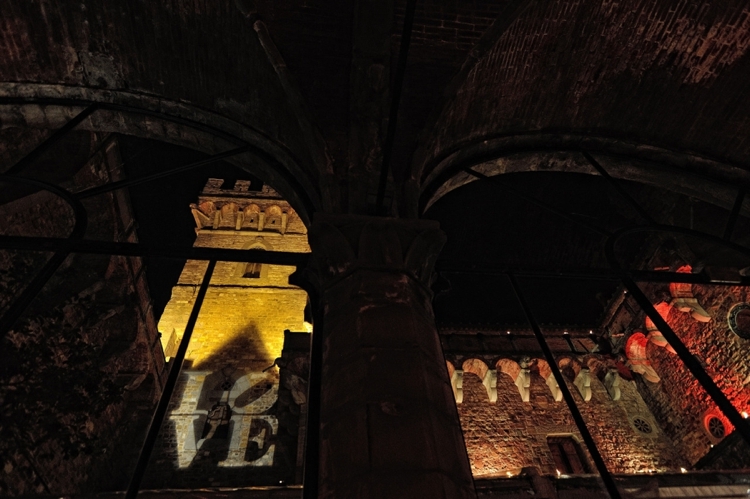 it’s a delicious destination set in an astonishing castle in Florence, and the crazy thing is, I attended a wedding in the very same venue last summer! 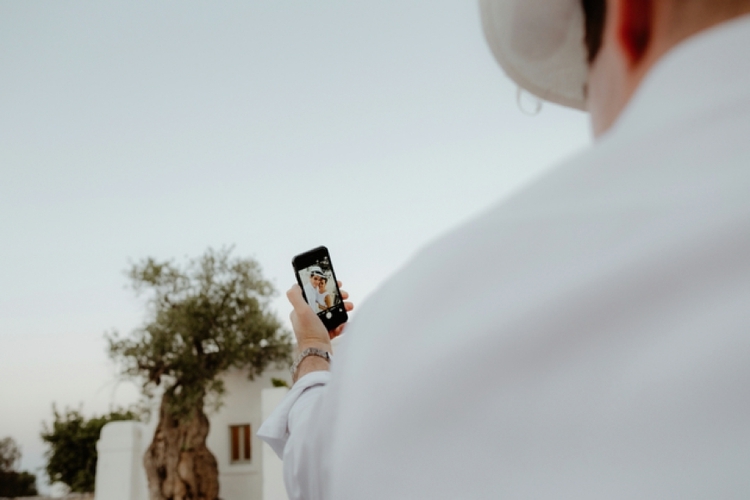 We requested no cameras, smartphones, or iPad use by any of the guest during the chuppah — we wanted everyone to be in the moment. The only people taking pictures and videos were our photographer and videographer. And what a fabulous pair they were: Edoardo Agresti captured all the stills, and Marco Caputo‘s film is simply a must-see at the end of the post. A gorgeous couple in fabulous attire having their day their way. Perfect. Anna, the Bride: My parents actually met in Florence and live there part of the year. I also have a large extended family that lives in Europe, so Florence was convenient destination for many guests. For those that would have to travel, I knew that a long weekend in Florence would be the most irresistible magical getaway. 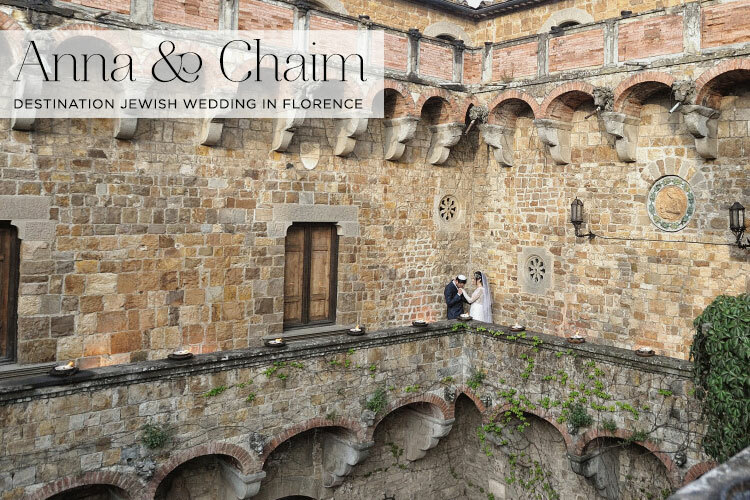 Originally, I wanted to get married in the Great Synagogue of Florence, as it just takes your breath away, but then we saw Castello di Vincigliata, a castle in the Tuscan hills- how could we not pick it? We contemplated having the chuppah in the synagogue and then transporting guests to the castle, but ultimately we thought the schlep to and from would disrupt the atmosphere. Chaim had his Shabbat Chatan at the synagogue so guests that attended were able to experience the beautiful Sephardi service and architecture. Every inch of this Los Angeles wedding is oozing old Hollywood style glamour from the private residence near Malibu where it was held (that only hosts one wedding per year!) to the bride’s incredible one-of-a-kind Lazaro gown. Positioned on a top of a cliff, with breathtaking views across the beach and the Pacific Ocean, the residence is normally used for filming and photo shoots (I’m talking Rihanna’s cover shoot for Vogue no less) and it’s impossible to imagine a more beautiful or romantic setting for a wedding. The ceremony took place on the beach right by the shore, under a stunning chuppah and one thing’s for sure, if you’re planning a romantic, dreamy beach-y wedding, this post will be taking over your entire Pinterest planning board! Without further ado, I give you Ali and Duncan. Ali, the Bride: We chose to get married in a private home in the Huntington Palisades in Santa Monica because what is a California wedding if you are not near the ocean! We chose this house because we felt it was the quintessential Los Angeles wedding venue. We wanted to be married on or over looking the ocean and this house gave us that old Hollywood feel while also being on the water.